Nearly every North Korea watcher will tell you that the famine of the mid-1990’s fundamentally altered North Korean society and the economy. The collapse of the socialist economy crippled the state’s ability to provide for its citizens, thus forcing individuals, including many who were part of the North’s vast security apparatus, to find other ways to survive. As a result, activities that would have resulted in severe punishments before the famine era—from black market trading and smuggling to viewing South Korean soap operas—became routine. For the country’s media and information environment, this loss of state control meant that once severely enforced restrictions on the consumption of foreign media also eroded, giving citizens access to far more outside media. Simultaneously, state-centered social organization was partially supplanted by connections between individuals buying, selling and trading with one another, as North Korea underwent a de facto marketization process. These developments caused a loosening of state control over media and communications, which many experts felt the regime would be unable to regain. However, since Kim Jong Un has come to power, new strategies for reasserting control over information and media appear to be emerging. By the time InterMedia’s first report on the North Korean information landscape—A Quiet Opening: North Koreans in a Changing Media Environment—was written in 2012, most North Koreans were consuming some form of outside media. The types of media ranged from shortwave radio broadcasts to South Korean films and dramas on DVDs. This was possible in part as media devices and content were being supplied across the border with China and in part because North Korean information control mechanisms to police unsanctioned media content had largely atrophied. Security personnel were happy to take bribes to overlook offenses such as watching South Korean soap operas and citizens were reporting less on one another for ideological infractions than they had previously. In the post-famine era, the state could no longer regularly reward loyalty; and as the influence of markets grew, money in the form of bribes became an important source of income for many security personnel. Viewing, listening to and sharing illegal media and information became an increasingly normalized behavior. North Koreans quickly adopted new digital technologies that facilitated these behaviors such as Notels and USB drives, as they became available and affordable. However, even as the technologies that supported unsanctioned media consumption became more advanced, media and information necessarily spread in an ad hoc person-to-person fashion as there were no internet or cellular data services available to normal North Korean citizens. While this made the spread of media inefficient and messy, it also made it extremely difficult for authorities to control, as they were unable to reconstitute the security state of the pre-famine era. After a brief initial flirtation in the early 2000s, in 2008, the North Korean government in partnership with the Egyptian firm Orascom introduced legal domestic mobile phones and service. At the time, many North Korea watchers assumed this new development would again be stopped when authorities realized how difficult mobile service would be to control or that they would not be available to citizens outside of an already closely monitored elite. However, as Orascom subscription numbers continued to rise into the millions, the North Korean media featured the devices in official communications, and refugees and defectors with quite ordinary social and economic backgrounds reported having owned and used domestic phones. Within a short time, it became clear that mobile phones were both in wide use and that use was broadly sanctioned by the government. Naturally, this raised the question of why a regime so focused on isolating and controlling its citizens would introduce such powerful communications devices. Even with the kinds of network controls that were immediately apparent, such as no international calling and no mobile internet, mobile phones represented a huge departure from the North Korean government’s previous security strategy of control by personal isolation and integration into state-affiliated social and economic structures. After spending decades mediating communications through organs of the state, why was the North Korean government opening up interpersonal communications among its citizens? Could they be desperate enough for the potential economic gains of advanced telecommunications that they were willing to prioritize that over security concerns? Was a new young leader, Kim Jong Un, naïve enough to not to fully grasp the potential risks involved? Sometime in 2015, it became clear that the North Korean authorities were anything but naïve, as the outside world began getting some of its first indications of the new kinds of censorship and surveillance solutions that were being created and employed. While it is unclear how much of the design and software development had been done prior to the rollout of mobile phones in 2008, by 2013-2014, mobile operating system updates had been pushed out to all domestic mobile phones which contained software referred to by technically knowledgeable North Koreans as the “signature system.” This software made all unsanctioned files and apps unusable on domestic phones and even deleted unsanctioned files off of micro-storage devices—such as micro-SD cards—that were inserted into a North Korean mobile phone. Technical analyses of this mobile software indicates that this automated censorship technique is quite sophisticated and very difficult even for technologically savvy professionals to undermine. In effect, it means that only apps and files that have been electronically signed by North Korean authorities are usable on North Korean mobile phones. North Koreans who used mobile phones in the country confirmed that when the mobile operating system update was instituted (most North Koreans refer to it by a change in the color of the signal strength display on the phone interface), the new signature system software effectively ended their ability to use their mobile phones to access and share unsanctioned files, from South Korean dramas and Korean pop songs to novels in .txt file forms. After a brief window in which citizens experienced the potential their mobile phones had as media devices, authorities completely eliminated that function. Moreover, the signature system represents just one of a suite of advanced security measures, many of which focus on surveillance and tamper resistance. For instance, one newly explicated feature appears designed to assist human security forces in conducting in-person inspections of mobile phones by capturing user activity histories and automatically taking periodic screenshots, which the user cannot delete. North Korean authorities have the dual advantages of a huge technological sophistication gap over their own citizens and having the unique ability to dictate what hardware and software citizens use. By pursuing censorship and surveillance priorities at the device level, the government has been able to introduce mobile phones that are extremely difficult to use as interfaces for unsanctioned media and open up new surveillance avenues that are far less resource-intensive than their traditional human security forces. Network Expansion: Will This New Security Strategy Move Beyond Mobile Phones? It is likely that the North Korean authorities view the introduction of mobile phones as largely successful, given the security features they have been able to include. Analysis of other devices and software such as tablet and desktop operating systems indicate that many of the defining security features of the domestic phones are also present for devices that are not connected the cellular network. This seems to suggest that authorities may be preparing for expansion of other digital networks such as the domestic intranet. This would allow the government to pursue a similar security strategy for a whole range of devices beyond mobile phones with the goal of moving citizens away from un-networked devices that authorities cannot track or control to those on government networks. Person-to-Person Connection: A Silver Lining? The North Korean government has been able to allow the introduction of legal mobile phones, while still maintaining some level of control of their usage. The rollout of new sophisticated censorship and surveillance tools are likely to severely limit the spread of unsanctioned media through mobile devices and open up some forms of communication to surveillance. Yet, it is also important to keep in mind what authorities are ceding. Given the availability and legality of mobile phones, North Koreans will undoubtedly experiment with the bounds of acceptable use—many already report routinely conducting quasi-legal business dealings via their mobiles. However, mobile phones in the North still provide the potential for much greater horizontal interpersonal connection between North Koreans. The wide proliferation of legal mobile phones effectively signals the end of the regime’s former strategy of control by individual isolation. As connections between individuals continue to broaden and strengthen, aided by mobile communications, informal issue constituencies will undoubtedly form and share information—farmers will connect and talk to each other about what’s important for farmers, computer programmers will discuss computer programming and so forth. It is through those connections and the start of informal, non-state directed social organization that North Korean citizens may begin to constitute more than a collection of isolated individuals and more credibly engage in some forms of state-society negotiation. As North Korea’s society and economy continues to evolve, connection among ordinary citizens provides a way to potentially coordinate efforts to influence the direction of those changes, which could prove as transformative as the influx of foreign media the authorities are going to such great lengths to block. In North Korea, only state sponsored media is considered legal for consumption. Punishments for accessing foreign media such as US sponsored radio broadcasts and South Korean dramas and films often included labor or political prison camp sentences for such offenses. For details on this feature and other elements of the North Korean Android Operating system see: Grunow, Florian, Niklaus Schiess, and Manuel Lubetzki. 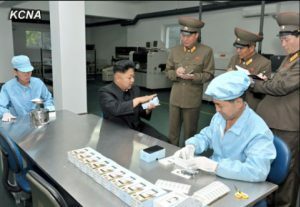 Woolim: Lifting the Fog on DPRK’s Latest Tablet, https://media.ccc.de/v/33c3-8143-woolim_lifting_the_fog_on_dprk_s_latest_tablet_pc.